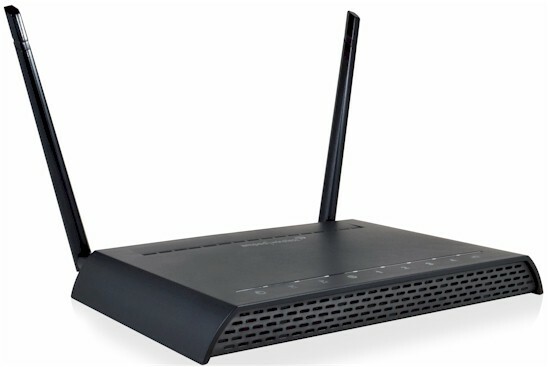 The RTA1200 High Power AC1200 Wi-Fi Router from Amped Wireless was originally going to be included in Part 1 of our AC1200 router roundup, but didn't have a valid FCC ID registration. The product now is properly registered, so here's the review. The chart below, taken from the Amped Wireless website, shows the RTA1200 one step below the RTA1750 that Tim recently reviewed. The RTA1200 and the RTA1750 are almost identical except for a few differences in radio components to produce the RTA1200's 2X2 design. Both routers use external antennas and about the only difference in the cases is the additional antenna on the RTA1750. The case has a dark charcoal color and a matte finish. The router is designed to sit flat on your desktop, but there are mounting holes should you wish to mount it vertically on the wall. The top panel has nine white LEDs. There are plastic light pipes from the top panel down to the board to redirect and concentrate the light. The company name as well as the designation for the LEDs appears to be molded in glossy finish so there's very little contrast between the case itself and the markings, making the LED designations difficult to see. The chart below shows callouts for the front panel LEDs. The rear panel of the RTA1200 is identical to the RTA1750 with the exception of having only two antenna ports. The RTA1200 is powered by a Qualcomm Atheros QCA9957 2X2 abgn SoC WLAN, which also serves as the 2.4 GHz radio. The 5 GHz radio is a separate QCA9882 2X2 802.11ac radio. If this architecture sounds familiar, it is. The RTA1750 uses a QCA9558 3X3 abgn SoC and a separate Qualcomm QCA9880 3X3 802.11ac radio. Both routers have the same amount of RAM (128 MB) and Flash (16MB) and use a QCA8337 for the five Gigabit Ethernet ports. The main PCB for the RTA1200 shares much of its design with the RTA1750. While board sizes and layouts are similar, the RTA1750 PCB shown below has more components because of the additional amplifiers for its 3X3 design. Table 1 below summarizes the key components of the RTA 1200 and the RTA1750. Both devices use the same Skyworks amplifiers and LNAs - the RTA1750 just uses three of each of the chips instead of two. The feature set as well as the user interface on the RTA1200 is essentially the same as what you'll find in Tim's review of the RTA1750, so I won't duplicate it here. The review includes a slideshow showing many of the admin screens. The screenshot below shows the landing page for the RTA1200. I've also included a gallery with just a few screenshots that I thought showed some of the interesting features of the router. I'll also briefly comment of a few features. You can set Packet/Second threshholds for eight types of Denial of Service attacks. Network settings - The local network setup supports 8021D spanning tree. The options are enabled or disabled. Firewall - you can set up each port on the router as an individual VLAN. For each VLAN, you could enable/disable, tag, set the VID and set priority. The firewall supports port filtering as well as port forwarding. Port triggering is not supported. The firewall also features Denial of Service protection for eight different types of attacks (see gallery above). Quality of service - You can create quality of service for a range of IP addresses, individual MAC addresses or IPv6 addresses. You can choose one of two operating modes: Restrict maximum bandwidth or guarantee minimum bandwidth. QoS is fairly basic and is not protocol based. You can control wireless output power to restrict the range of you coverage. There are five power levels ranging from 15% to 100%. 100% is the default. The RTA1200 supports both local logging as well as logging to an external Syslog server.